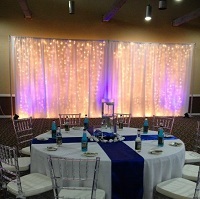 White Chiffon Wall Drapes with White Net Light Back Drop. 2 Panels. 8' - 14' Tall x 7' - 12' Wide each. *Includes wall panels Only. Additional Décor pictured including colored up lighting must be requested separately.